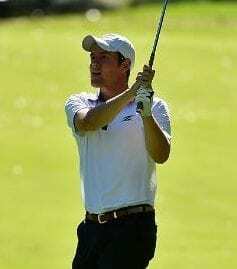 Putting is the least physical part of golf, but requires the most finesse. If there is anything that is true about putting, it is that you can make putts in many different ways. The only commonality between the best putters in the world is their ability to consistently line the putter up, and hit it successfully at their target. If you struggle reading greens, lining your putter up consistently, or making short range putts consistently, I’ve got an awesome tool for you! If you haven’t heard of Dave Pelz by now, let me introduce you to him… Pelz is a “short game guru” who has taken his previous experience doing research at NASA, and has applied it to the game of golf. Although his research findings are too technical and complex for most golfers, they have transformed the game of golf forever. Not only has he done some quality research about golf, but through his research, he has helped several tour players. Cumulatively, his teachings have led to 19 major championship victories, most notable being Phil Mickelson. If you want to know more about this brilliant guy, here is a great article. Anyways, through years of research and testing, Pelz developed a device call the “Putting Tutor,” which has been used by Phil Mickelson and many others on tour for years. I picked up the device about four years ago, and it has become an essential part of my preparation for tournaments. 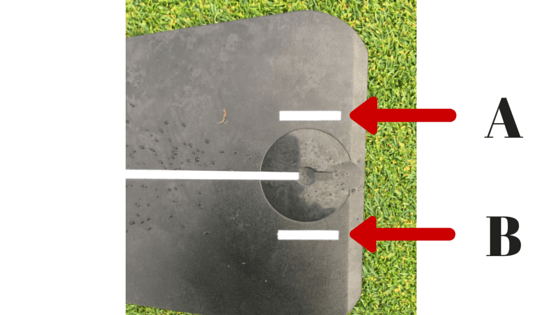 Throughout this post, I want to show you how the Putting Tutor can help ANY golfer read greens better, align the putter better, and get better speed control on putts. Let me start by introducing the device. It really isn’t all that complicated, but is an extremely powerful tool. There are only two pieces that you have to worry about, which are the Putting Tutor itself, and the two marbles that sit at the end of it. There are three settings for the marbles, although I personally stick with the pro setting. When using the Putting Tutor, you will set the ball on the dot, and line your putter up with the straight edge at the back of the Tutor. You will also notice there are two lines on either side of the golf ball. These are used to determine where your eyes are aligned over the ball (see picture at bottom of this post). If you can’t see part of either of the lines, this means that you eyes are either too far over the ball, or too far inside (being too far inside isn’t always bad, but too far over the ball is in my opinion). In his book, The Putting Bible , Pelz did a study showing that 100% of amateur golfers under-read their putts! I was amazed when I heard this, and am still a bit skeptical of this startling stat, but would definitely agree that I was severely under-reading my putts. 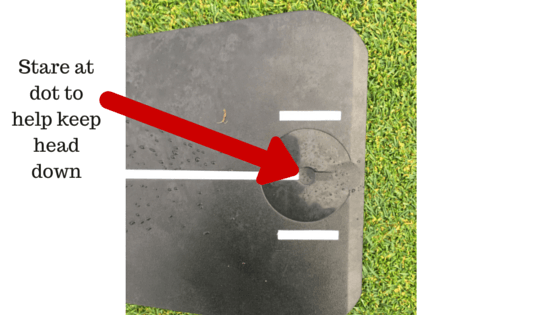 If you want to know a little more about how green reading works, check out my post on Aimpoint Express here. So we all under read putts, but how do we fix it? The answer is in the Putting Tutor. When the marbles are on the pro setting, the only way you can make a putt while avoiding knocking the marbles off is by reading the putt correctly. If you’re just starting out with the device, do a little experiment with yourself: Find a breaking putt, and put a tee in the ground where you think you need to start the putt to make it. Now, align the putting tutor to this tee, and hit putts until you’ve gotten it through the pro marble setting. Chances are, you’ve under-read the putt, even after I told you that you would do so. This is because a putt actually starts breaking the instant you strike it, and our brains don’t often take this into account consciously. By using the putting tutor consistently on breaking putts, you will start to see the correct reads for different putts hit at different speeds. If there is anything that I am always monitoring in my putting, it is my eye alignment. I prefer to position my eyes just slightly inside the ball (as a right handed golfer, when I look down at the putting tutor while the ball is on it, I see all of line B, and about 80% of line A- see picture below). If you use this device often, you will become more consistent with your eye position, which is essential in making putts. If you don’t believe me, check out this video featuring Rickie Fowler. He doesn’t use the putting tutor, but brings up a great point about consistent eye position. The most important part of putting is face alignment. On a 3-foot straight putt, as long as the face impacts the ball square to the target, it doesn’t matter what stroke you putt on it. You could swing the putter 45 degrees in to out, but as long as the face arrives at the ball square to the target, the ball will go in (assuming correct speed of course). I use the 3-footer example to simplify things, but in reality, this theory applies to all distances! This is why you see so many different strokes on tour achieving the same thing: making putts. The putting tutor helps you understand what correct face alignment looks and feels like. If I’m off on my alignment at any time, I’ll line my putter up to the putting tutor, and shift my body around until it “feels” like I’m aimed at my target. If you hit enough straight 10 footers with the putting tutor, you will surely start to get a better sense of your aim. As we all know, if you don’t hit the putt with the correct speed, it won’t go in. The putting tutor helps you with speed control (especially on breaking putts), because it requires you to make the putt at the same speed over and over again. When I use the Tutor, I will line it up so that I have to make all my putts at a “die” speed. I like to see the ball trickle over the front edge of the cup rather than banging into the back of the cup. With the putting tutor, you will be able to get a sense of how different lines match up with different speeds. If you are a charge putter like Arnold Palmer was, you will naturally read putts with less break than someone like Jack Nicklaus, who would die all of his putts in the hole. I start with a straight putt to get myself feeling the correct alignment, and the correct stroke that will get the ball through the marble gates. Once I feel good about stroke and alignment, I’ll move on to the breaking putts. Sometimes, if I feel like my green reading is a bit off, I’ll hit a few different putts from right to left (of different severities), and the same for left to right breaking putts. In his videos, Pelz recommends placing a tee in the ground where the Putting Tutor is aimed, but I don’t do this, because I am a “non-linear” putter. Once I have the Putting Tutor aimed correctly, I just imagine where I want the ball to enter the hole, and I stroke the putt. If you are linear (find out what you are here if you haven’t already done so), it would be effective to put a tee in the ground, and practice aiming the putter at the tee for breaking putts. You won’t always make putts by getting the ball through the marble gates with the correct speed, even on the pro setting. Sometimes, when there are spike marks on the green, you will hit a perfect putt through the marble gates, and it will not go in. Don’t get frustrated when this happens! Just focus on getting the ball through the gates with the correct speed. When I putt with the Tutor, I focus on keeping my head down on all putts. The dot that you set the ball on is a great way to make sure you’ve kept your head down. You should be able to see the dot under the ball after you’ve stroked the putt. If you don’t see the dot, you have pulled your head up too soon. Why 10 feet? – It is where the birdies are at! As of this year, the tour average from 5-10’ is about 55%. To make birdies and save pars, you’ve got to be nails from this distance. Frequency of Routine- I spend anywhere from 5 minutes to an hour working with the putting tutor at the beginning of EVERY practice session. I’ll also warm up with it for a few minutes before a tournament round. As you may have noticed, I don’t put a time limit on any part of this routine. I go until I feel comfortable over the putts. 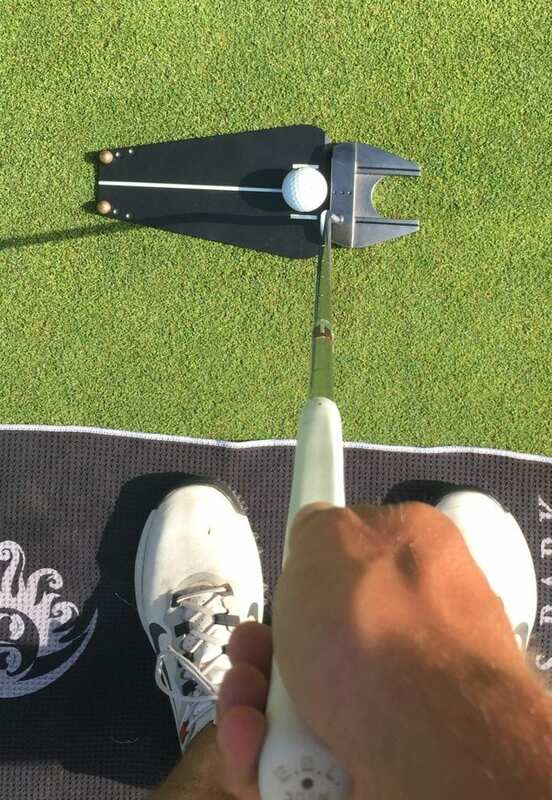 If you’re just starting out with this device, it may take you a while to start consistently getting the putts on line and feeling comfortable. Be patient! It’s not meant to be easy. So that is how I use the Putting Tutor, and I hope you’ve found it helpful! This device has dramatically improved my putting since I purchased it, and I know that it will improve yours if you commit to practicing consistently with it! Practice Product Reviews, Putting and Short Game. permalink.